Muse's 'Drones' Tour in Switzerland - Malecon Ltd.
ZURICH, Switzerland - For Muse's two 'Drones' tour shows at the 13,000-capacity Hallenstadion in Zurich on May 11 and 12, ceiling weight limitations meant that the complete Muse stage had to be supported by a giant ground support system. Malecon Ltd. turned to Prolyte as part of the staging and rigging solution. Not much, but since all things that are flown overhead need support at one point, that is where this story starts. 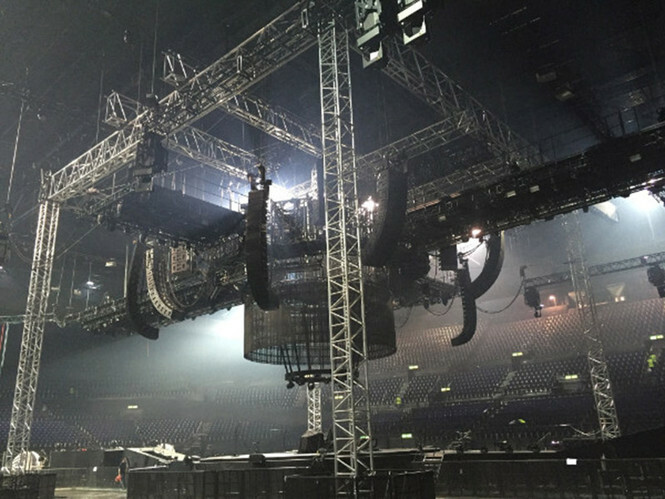 For a large show you normally need a lot of loading capacity and sometimes the existing loading capacity is just not sufficient, like in the Hallenstadion in Zurich, Switzerland. For every problem there is a solution and is this case the solution was offered by Malecon Ltd. Known for their expertise in heavy lifting and for their large stock of extraordinary strong truss, they were called in for help. After some thorough calculation, Malecon brought in a ground support system based on the Prolyte CT tower system with D75T truss as towers and M145RV and B100RV truss for the grid. On top of this grid Malecon added an extra layer of M145RV (Mammoth) truss to gain sufficient height and strength to accommodate the complete set. The total dimensions of the ground support were 22 x 22 meters width and 16,5m. height. The whole system carried 32 tons of load.